Purvesh Khatri, Ph.D., associate professor of medicine and of biomedical data science, and his team used a computational approach to pinpoint a blood-based genetic biomarker to determine an individual's susceptibility to the disease. "We've been after this for about four years," Khatri said. "To our knowledge, it's the first biomarker that shows susceptibility to influenza, across multiple strains." 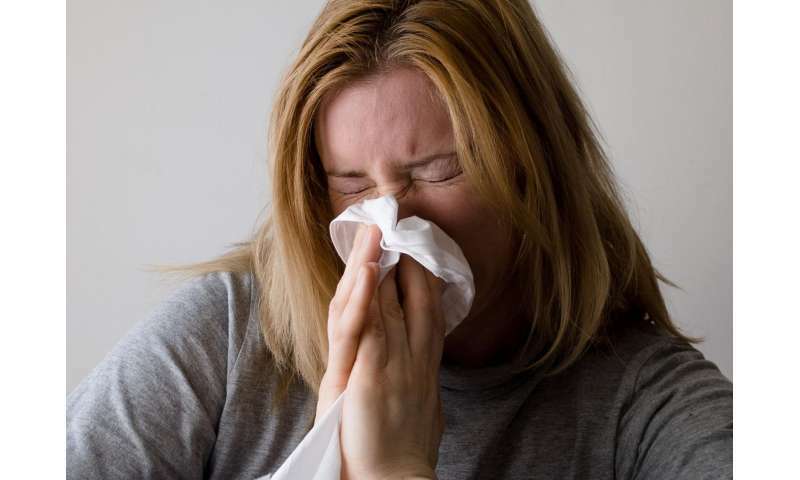 The biomarker is a gene called KLRD1, and it essentially acts as a proxy for the presence of a special type of immune cell that may be a key to stamping out nascent flu infection. Put simply: the more of this cell type found in a person's blood, the lower their flu susceptibility. The research even hints at new avenues for pursuing a broadly applicable flu vaccine. "The idea was, instead of looking at 20,000 variables [or genes], let's bring it down to 20—let's only look at 20 immune cell types and see if any of these show a consistent pattern in regard to H1N1 or H3N2 flu infection, and then we'll look at genes that are related to that cell type only," Khatri said. "And that turned out to be the answer." Using a computational approach developed in his lab, Khatri and his team parsed the identity and proportion of cells present in participants of two studies—one conducted at Harvard University, the other at Duke University—comprising a total of 52 individuals who volunteered to sniff up live influenza in the name of science. The researchers were looking only at types of immune cells present in each individual just before they were infected with the flu. "We found that a type of immune cell called a natural killer cell was consistently low at baseline in individuals who got infected," Bongen said. Those who had a higher proportion of natural killer cells had better immune defenses and fought off illness. "So we asked, 'What are the genes that represent natural killer cells?' And there turned out to be this one gene, KLRD1, that seemed to be a good target," Bongen said. KLRD1, when expressed, manifests as a receptor on the surface of natural killer cells. KLRD1 is basically a counting chip. When the score was tallied, Khatri saw that, on the whole, those whose immune cells consisted of 10-13 percent natural killers did not succumb to the flu, whereas those whose natural killer cells fell short of 10 percent wound up ill. It's a fine line, Khatri said, but the distinction between the groups is quite clear: Everyone who had 10 percent or more natural killer cells stood strong against the infection and showed no symptoms. Khatri said his findings could help health professionals understand who's at the highest risk for flu infection. "If, for example, there's a flu epidemic going on, and Tamiflu supplies are limited, this data could help identify who should be prophylactically treated first," Khatri said. More broadly, Khatri said that this research exemplifies the power of "data repurposing." "Our work shows how you can use data that exists from previous studies to answer questions that those studies alone would not have been able to answer," Khatri said. "But by aggregating the data, we were able to find a signal across both studies and use that to discover something new."